Here’s where the wheels kind of come off my project. Anthony Powell’s A Dance to the Music of Time is a twelve book cycle, a “dodecahedral masterpiece“, says Lev Grossman, which by my count should make the Time Magazine list actually number 111 books, not the vaunted 100. The bet that myself and the Lady E. had between us was to see who could get farthest through 100 books (or movies, in her case) in one year. I am definitely winning the bet at this point in time, if you were wondering, but I have a sneaking suspicion she’s just stringing me along with the intention of absolutely crushing me with a week-long movie marathon down the line. So we came to a compromise. I only have to read through the first three books of Dance, the “1st movement”, while she only needs to sit through one of the Lord of the Rings movies (what can I say, she really hates them). And now that I’ve read through those three books, I’m somewhat conflicted. I’d like to keep going through the cycle, but alas duty calls. Anyway, here’s the synopsis. Nick Jenkins, when the story begins, is a young man just about to leave Le Bas’ secondary school and head to university. He’s friends with Peter Templer, a charming womanizer-in-training, and Charles Stringham, a restless aristocrat with a talent for mimicry. There’s another boy at the school too, named Kenneth Wimperpool, whose sartorial and social eccentricities have made his last name an adjective for that which is out of the ordinary. A Dance to the Music of Time follows these three boys into manhood and beyond, though the three books I’ve now read, A Question of Upbringing, A Buyer’s Market and The Acceptance World, only take them into the early 1930s or so. Time is not clearly delineated in the narratives, you have to instead rely on your knowledge of early Twentieth Century history to orient yourself in time (the Manchurian Crisis is mentioned by name in Acceptance, marking it as occurring around 1931-1932), or look it up on Wikipedia, if you’re lazy. Question follows the four boys as they leave the last year of what we’d call high school now, and through the early years of college. Buyer’s Market takes place a little later, as the now young men have begun to find their footing in business and life, and concerns itself mostly with the courting rituals of the time. Acceptance continues down the romantic avenues set up early on, and introduces politics into the stew in a big way, mostly Socialist politics, reminding me a lot of Resolution Project Book Thirty-Four, The Golden Notebook. Nick Jenkins comes from the great English tradition of narrators who are more like mere observers, also seen in the form of Herr Issyvoo from Christopher Isherwood’s Berlin Stories, and especially in Charles Ryder from Evelyn Waugh’s Brideshead Revisited. 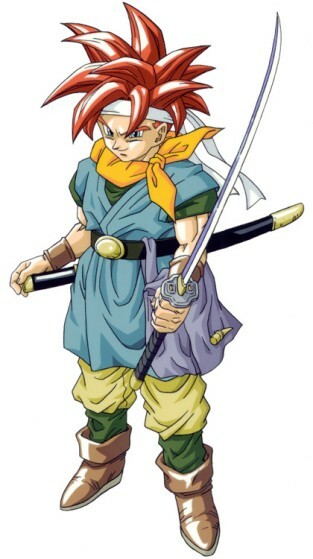 I understand why this device is used over and over, as it’s a great way to analyse cultures anthropologically (especially when you’re reading about them from our time period, without the benefit of total understanding of the era), but honestly these sorts of guys remind me more and more of Crono from Chrono Trigger, sponges who experience everything vicariously through their friends. I’d like a main character with a little more agency, please. As for the books themselves, I liked two out of the three quite a bit. Question is an entertaining schoolboy lark that is cut through with hints of the darkness looming over everyone’s heads. Buyer’s Market, though, was a bit of a chore to make my way through. It concerns itself for about half the book with the events of one long night in the world of London’s hostesses and parties. It was interesting at first to see how well-to-do types at the time courted one another, and the etiquette involved in place settings, dances and attire, but after 100 pages or so of this and little else, it got old. 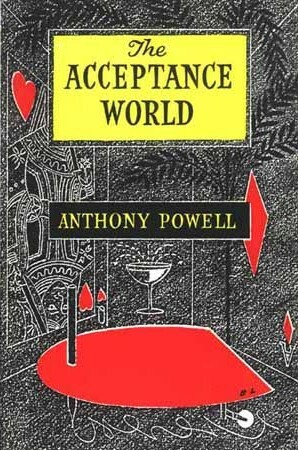 I did like Powell’s spot-on depiction of a young man in “love” with various women of his acquaintance, more infatuated with the idea of love itself than any one girl. That was excellent. Acceptance picked up again, though, and I pretty much devoured it in two days. You can see Jenkins maturing almost page by page in this one, and his eventual (real) romantic pairing felt very organic and recognizeable. I noticed an interesting theme running through these three books, the idea of great men and their influence on the relatively small world of the London upper classes. A few figures loom large over everyone else in the books, and here Powell’s use of Jenkins primarily as an observer works really well. We never really get to know Sir Magnus Donner, a successful businessman and owner of the Donners-Brebner industrial concern, nor his secretary Bill Truscott, who was a big deal during Jenkins’ university years. Rather, we hear about them in hushed tones more resembling tales out of mythology than anything else. 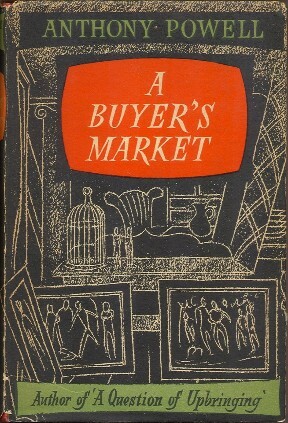 In fact, you can extend this metaphor to give each book an older patron who sets the tone for the story; Le Bas, schoolmaster to the boys before they leave for college or the City, is the big influence over Upbringing, while Edgar Deacon, a bohemian painter and friend of the Jenkins family is a major player in the events of Buyer’s Market. 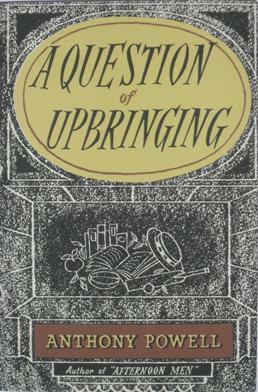 The author St. John Clarke, who is beginning to fall out of popular and critical favour, is fought over by two more of Jenkins’ university pals in Acceptance, the dueling authors Mark Members and J.G. Quiggin, who both want influence over him. In addition to those three, we also learn a lot about Jenkins’ Uncle Giles; we actually learn more about him than we do his nephew, at least in these three volumes. He’s kind of a crank, whose primary aim when dealing with his family members is to try and weasel more money out of “The Trust”, this being the inheritance held for everyone. His ideas about how the world works are entertaining, as he finds that “all material advancement in the world was the result of influence, a mysterious attribute with which he invested, to a greater or lesser degree, every human being on earth except himself.” (Upbringing, p. 66). We all know someone like that, who believe that people who “get ahead” are just lucky assholes who overshadow their own obviously misunderstood geniuses. Total pages read since January 1st: 8977 pp. Good thoughts. I’m not sure what I’m going to do about this one yet. But I don’t have a timeframe so I might do all of them. I’m still debating on this one too. I think I’ll just put it off for a while. That usually solves problems. Doesn’t it? I think I’m reading Blood Meridian next…I’ve heard good and bad about it. I’ve tried to get through Blood Meridian a couple times before this reading project, but it’s really hard for me. There’s something about the banality of the constant violence that makes the book really boring, and while I’m fully aware that’s kind of the point, I still don’t like it. Also the constant need to describe every single shrub, tree and weed the characters walk by is incredibly irritating; I couldn’t care less about the flora of the American West. Also: the lack of quotations marks drives me up the goddamn wall.